Being a diversified farm, like many in the Willamette Valley, usually means that this time of year you’re in a fairly steady pace of transition. It’s the clash between crop year 2018 and 2019 which often looks like a lot of open dirt fields, a lot of dust, and a few crops left to pickup. We have crops that have been harvested, fields that have been worked down ready to be planted, crops that are just starting to mature and some that we won’t even look at harvesting for another month or more. This field is ready to be planted to tall fescue. Tall fescue is perennial so we will hopefully leave this field in for many years, meaning this will be the last time we have to work the ground and have open soil here for years to come. It’s one of the reasons that I refer to this “season” of farming as triage. Everyday is different. Everyday is a look at the weather, check the fields, look at the soil, make a plan kind of day. Rarely is there an autopilot project, which makes management this time of year tiring and stressful. Fields for grass seed planting this fall need a seed bed that is smooth as a dance floor. We have worked this soil about 7 times to get the field worked down to be ready to plant. There was also a ton of organic matter from the clover last year that has been worked into the top soil. Today Matt and I are out in the orchards picking up drip tube from our hazelnut trees. These will be harvested around the end of September through October. The water on the squash has also been turned off and now we wait for the drying down to begin before they come get the seeds. And finally radish seed just got harvested yesterday and will head to the cleaner today. Then more ground work and tractor time, more planting and prepping to start this whole crazy life of farming again for another year! This year has proven so far to be pretty good, hoping that trend continues as we close the books on 2018. 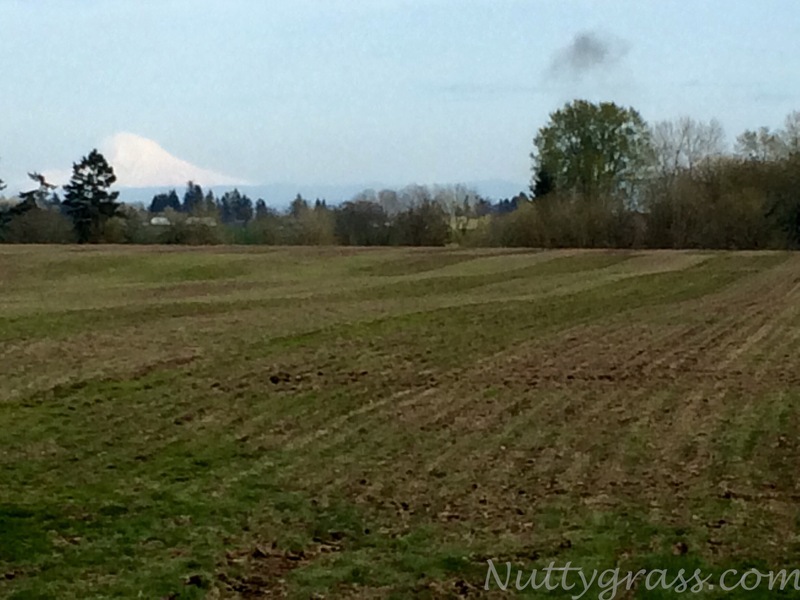 If you live in Oregon you have been seeing a major change in the landscape of the fields throughout the I-5 corridor. Thousand and thousands of little hazelnut trees have been planted the past 10 or so years. And here at Kirsch Family Farms, the landscape is also changing. This is a photo of our first planting of Jefferson trees in 2010. We have older hazelnut orchards of Barcelonas, planted in 1990. We also have some newer varieties, mainly Jeffersons. And this year we put in a third variety called Wepsters. The reasons for our plantings and even the delay in plantings until more recent years has a lot to do with disease management and pressure, and a lot of great work done by Oregon State University to help us with those issues. But it also has to do with timing of harvest, early or late fall can mean the difference between a dusty (preferred) harvest and a muddy mess of harvest. And also how much land we want to take out of production for a number of years, to then leave in a permanent or basically permanent cropping system. What you are seeing here are the newly planted trees. Too small to really see the tree itself. It is surrounded by a protective tube to keep it safe from the sun, and has a bamboo post next to it to give it more strength. This year we planted the Wepsters right behind our house on a small field that was soon to be, I guess you could say “tree locked.” Meaning with all the orchards being planted around it, there wasn’t going to be much room for getting larger equipment needed for grass seed or grain production. Case in point, our combine header was rubbing tree branches as it made its way back harvest the wheat. These are the first rows marked out for our new planting of hazelnuts. So we decided it was time to plant a few more trees. We had a neighbor come and mark out the rows using GPS. Then at the cross-hairs we planted a tree. Most of the trees were Wepsters (the main variety), with a mix of pollenizer trees as well. (Hazelnuts can’t pollenize themselves so you plant pollenizer trees throughout the orchard). These newly planted trees should start to produce nuts in about 4 years, and we hope they will produce nuts for another 4 generations! Farming is an industry that is always changing and evolving, and the type of crops that you plant in the ground is no different. It will be exciting to see these trees as they grow literally right in our backyard and seeing a little bit of that large scale “changing of the farming landscape” up close. We had a few nice days here in Oregon last week, and when it comes to spring time that means all hands on deck! This year in particular has been challenging because the rain just hasn’t stopped enough for fields to get dry in order to do much spring work. So in a matter of three days we were all running around like chickens with our heads cut off, fertilizing, spraying, planting, painting, you name it we were at it! I had two sick kids at home so my role was mostly logistics manager via cell phone from the house. Nevermind a crying infant and wild toddler…I think I pulled it off pretty well. But I did get to switch with Matt to enjoy a glorious 75 acre roundup spray application. Round up in the past few years has gotten a bad wrap. Whether it be studies that it’s found in breast milk or the link to those oh so awful GMO crops, most are all very unscientific and unfounded. But that’s a whole series of blog posts, today I wanted to share why round up has made us more sustainable on our farm. We have been growing no till spring wheat for about 5 years now on our farm. No till means that we don’t work the ground after the last crop is harvested. This saves not only time, fuel, and money, it also saves all the worms and bugs that have been making homes in the soil. It gives the soil another year of resting which reduces soil compaction too. In order to do this however we have to be able to give the wheat a chance to grow in an uncompetitive atmosphere. If you were to take the field below, notice all the grass and weeds that are growing (basically everything that’s green)? That is all volunteer crop and weeds that if we planted into and never killed would be too much competition for our wheat crop and the wheat would grow a little bit, but would never be enough to even be worth harvesting. 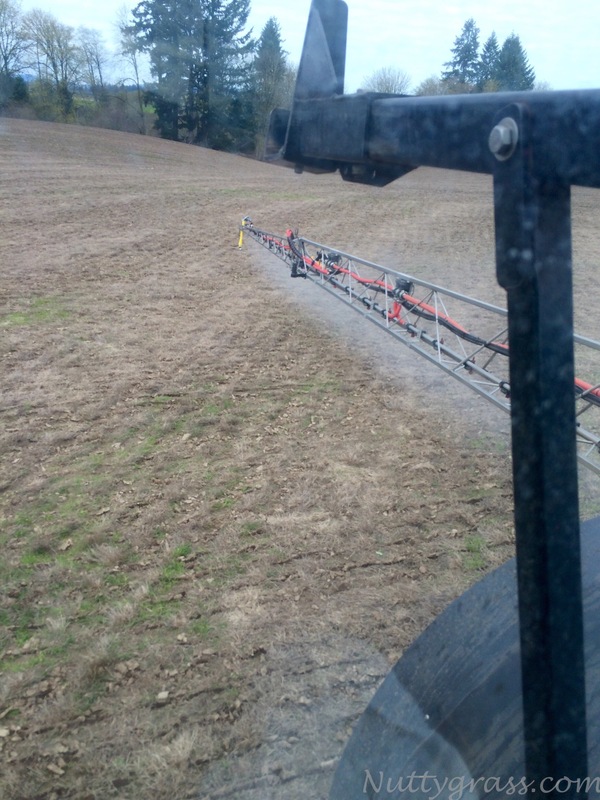 So in the fall we spray round up on the fields to kill what grows after the final harvest of grass seed. Then we come back right before or right after planting to get one last application. Also round up only kills what is on the top of the soil, not disrupting any future plantings. 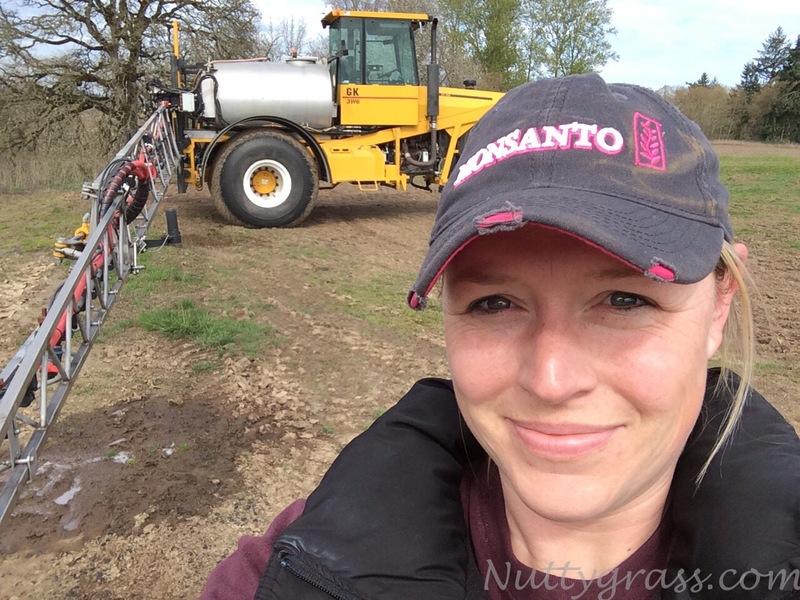 I proudly wore my Monsanto hat, even though I was applying a generic brand of round up. I can’t help but appreciate having round up as a tool in our tool box that allows us to be better farmers and treat the land well.